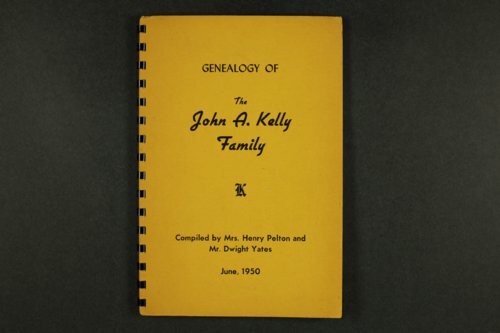 The Genealogy of the John A. Kelly Family contains letters, family trees, and information concerning the capture of Fanny Kelly by the Sioux Indians. The Kelly Story (untitled) is not dated and the author is unknown. It tells of Fanny Kelly's life from the time her family left Kansas for Idaho in the summer of 1864. There is a detailed account of the attack on their wagon train; capture of Fanny Kelly, her niece Mary Kelly, Sarah Larimer and her son; killing of three men; Mary's death; and the wounding of Mr. Larimer. It tells of Fanny's nine months among the Sioux and her release at Fort Sully. Josiah and Fanny returned to Kansas where he later died of cholera. The story includes a dispute between Fanny Kelly and Sarah Laimer over a book written about the Indian attack. A court decided in Fanny's favor and her book was an immediate sensation. Later, she married William F. Gordon and lived in Washington, D.C. until her death on November 15, 1904.